All around the world, we have seen images of Japan's recent disasters. Yet, at the same time, I have heard nothing but reports which confirm the honor and dignity of the Japanese people, despite their unimaginably difficult circumstances. One American reporter mentioned that, in all her years of reporting from the sites of disasters, she had never seen a situation in which (despite the desperate need for food and clean water) the vending machines and stores remained un-violated. Another mentioned the stoic courage of the Japanese -- their unfaltering dignity, even as they stood among the ruins of their homes. I heard an interview with one old man who, at the end of the questions, closed by saying to the reporter, his voice formal and unwavering: "Thank you for coming." My eyes welled with tears, at this. I could feel the dignified bow in his words. Still another reporter pointed out the manners of the Japanese people in shelters -- how they lined up for meals with the utmost courtesy and self-organization; how they remained silent at night out of respect for each other, even in rooms packed with hundreds of displaced souls. Their courage is obvious and their composure and dignity should be a model to us all, in every part of the Earth. I do have a number of Japanese readers, who have continued to read my posts of late. I write this to honor them and to honor an ancient culture which is full of tradition yet constantly relevant and important to international happenings; a culture that stands as firm as the venerable Mount Fuji, strong and immovable, despite the great waves and the shaking of the Earth -- just as it does in the distance of the famous work by Hokusai, above. Very nice. I sleep under a giant size print of that Hokusai, actually. I will look at it differently before bed tonight. Once again, you show good taste, HC. (In the Hokusai, not my piece.) 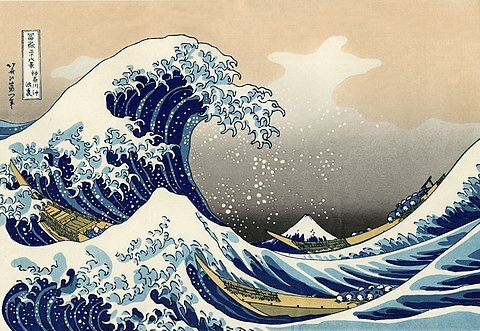 That print goes to show how the threat of the ocean must have always loomed in the minds of the Japanese. Thanks!